Latoya K. Warner is an energetic and discipline young lady who hails from the picturesque Tropical Caribbean island of Sugar City, St. Kitts. Her life long dream is to become a professional world class model and actress, blended by her maturing skill as a fashion designer. Latoya is a very ambitious, determined goals achiever, who was born on September 9th 1986, under the zodiac sign of Virgo. Latoya officially joined the modeling agency, Reign of Elegance. Unrealizing that this agency was built for the owner’s self interest, she canceled her membership. She’s presently modeling freelance, as her goal is set to modeling in Europe. It is not long before Latoya had a taste of success. 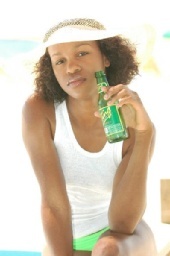 On February 14th 2004, she entered a the St. Kitts Nevis 4th Knoxx Modeling Competition in which she won. Latoya says that she sees herself, not just a girl of dreams and goals, but a bright light which leads to the right path. Her desire is to expose her talents and show the world what she can do and what she’s made of as she capture all there is to capture. She adds, “my road model is Oprah Winfrey; because of who she were, and where she came and having that talent and potential to achieve what ever your heart desire and to expose to the world her gifted talent from God. In her spare time, Latoya never misses an opportunity to catch a football match which is another one of her passions. Latoya’s involved in her church as a Sunday School Teacher and also a Red Cross member, which illustrates of her talents and interests.